Eating well is certainly a part of my days well lived so I decided to share some of my favorite recipes and how they became my favorites. I can hear my husband saying, ‘but you don’t really like to cook’. The truth is I do like to cook, but I don’t like to plan my menus. Due to poor planning, cooking often becomes a chore (maybe that will be the topic of another post). Once I have the ingredients and recipe in hand, I rather enjoy being in the kitchen. And most things I cook are tasty. But I’ll admit, there is a good percentage of the population that IS a better cook than I am. That said, I do have a few specialties in my recipe box. I am a good pie baker. I love to bake pies. When someone tells me they are not too fond of pie, I think possibly they have never really tasted pie as it was meant to be. I have yet to eat any pie at a restaurant that compares to a pie baked to perfection by a good pie baker. And I live in the heart of an Amish community. There are about a dozen pies on the menu of every restaurant in town. And I don’t care for any of them. Like some people are picky about their coffee, I’m picky about my pie. Pies are easy to bake. The recipes are usually simple enough. However, one of the secrets to pie baking is having a tutor in the kitchen the first time you bake one. Pastry crust is hard to learn from a cookbook. Even though the recipes are pretty straight forward, it is hard to convey on paper how the dough is suppose feel in your hands before its ready to go into the pan. Having someone stand over your shoulder and coach you step by step ensures that you have the right “feel” for the crust. With a thin flaky crust, you are well on your way to a fabulous dessert. My pastry tutor was an 18-year-old friend from work. We were both newly married women, and I challenged her when she told me she could bake good pies. Heaven knows I was struggling to put anything edible on the table at that point. My husb and still turns his nose up at Tuna Noodle Casserole almost 40 years later (I guess one cannot live on tuna alone). At the challenge, my friend extended an invitation to a Saturday baking day at her home. She let me do the mixing, rolling and pinching, but she guided me through every step. After the dishes were done, and the pies had cooled, we sat down to the most delicious dessert I had ever eaten — and I had baked it! The rest is history. It’s like the age-old lesson, ‘give a man a fish and you feed him for a day; teach a man to fish and you feed him for a lifetime’. Yep, I learned to “fish” that day. If you have never attempted pie baking, I wish someone could be there in your kitchen with you . They could help pick through the fresh cherries to “get all the pits”. They could watch as you cut a signature design into the top crust to allow th e filling to vent. You could take turns watching through the oven door as the crust browns and the filling begins to bubble (that’s how you know its done). 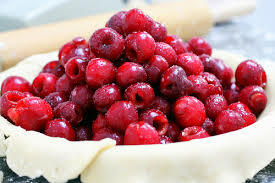 As you will see, there is nothing special about the recipe I use for cherry pie. It’s the one found in your Gramma’s cookbook. 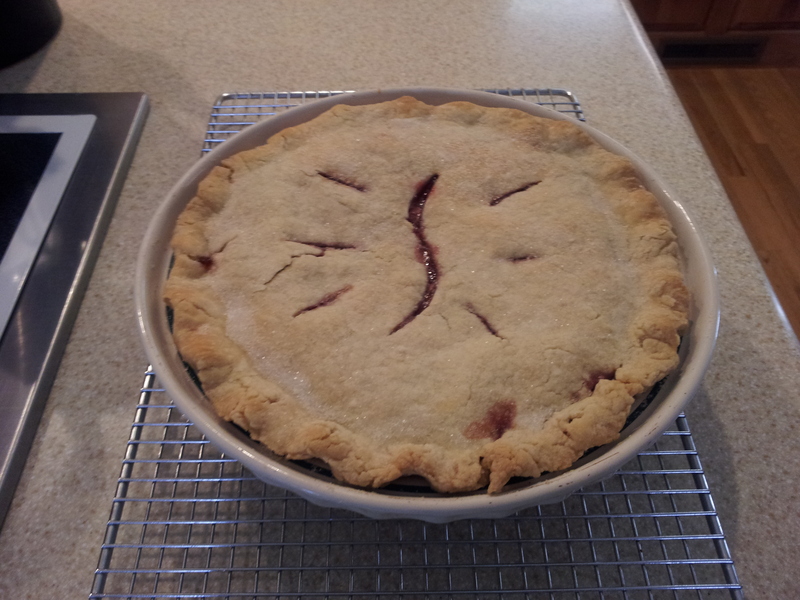 I am grateful for that dear friend who passed along her knowledge of pie baking. I have since taught my daughters. The secret is in the lesson. Sift flour and salt together in a large bowl. With a pastry cutter, cut the butter into the flour until the size of peas. Then work the mixture between your fingers until all the butter is worked into the flour. Add the ice water, and with a fork, quickly mix into the flour until a dough is formed. The less you work with the dough at this point, the better the crust will be. Divide the dough into two pieces. On a floured surface, roll the dough into a disk the size of your hand. Pick up the dough and turn it over, dusting it again with flour. Continue to roll until thin. Place in bottom of 9 inch pie plate. Roll out the other dough in the same manner. After filling the pie with your fruit and glaze, place the other piece of pastry on top. Trim the edge and pinch edges together. Cut a pretty design in top crust to allow filling to allow steam to escape. You may brush the crust with an egg wash if you desire a darker, crustier top crust. 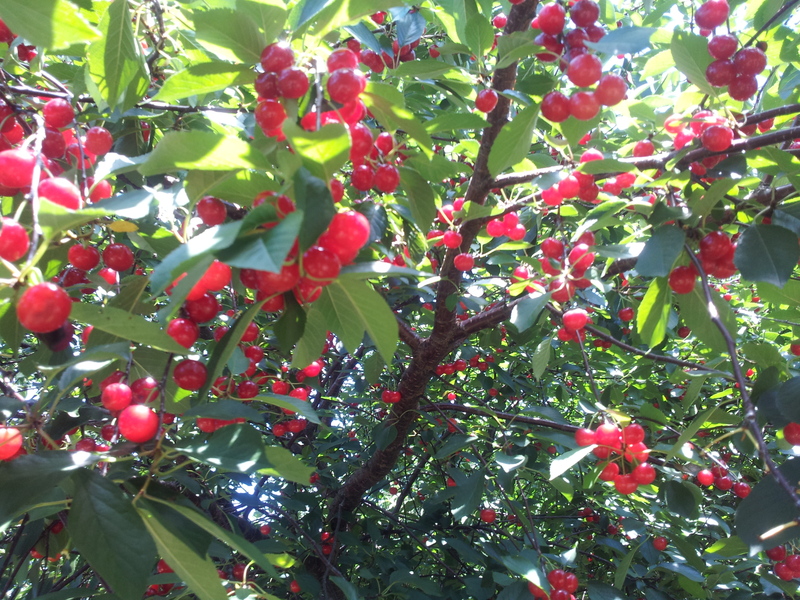 Pick through cherries to remove all pits. Put 3/4 cup of the sugar into a medium sauce pan. Add the cornstarch and mix well. Pour the cherry juice over sugar and stir; heat over medium heat, stirring occasionally. Bring to boil and then cook for one additional minute. The cornstarch will lose it’s milky look and become a “clear” glaze. It will be very thick at this point. Add the butter and the remaining 3/4 cup sugar. Combine cherries and glaze. Fill pastry shell and bake at 375 degrees for 50 minutes or until crust is golden and filling is hot and bubbly. Makes one 9 inch pie. Tasty post, Connie — all around! Ingrid, Thanks for reading my posts. Thank you for encouraging me to write. 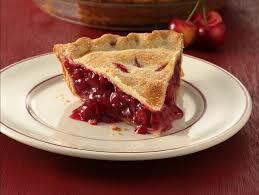 I want to make a cherry pie with my Aunt Connie! Will you be my tutor?